You know the kind I mean…the baked on, stubborn kind of grease that doesn’t come off with soap and water. The kind of grease that bakes into your stainless steel pots and pans and gets worse over time if not properly treated. I have a “dirty” little secret to share with you. I don’t properly clean my pots and pans each time grease gets baked into them! I know I know!! It’s awful, why don’t I take the extra few minutes to clean them the right way?! To be honest, I never really looked into finding the right cleaning tool to remove the baked in grease…until now. And the worst part of all this…I have the cleaning tools right in my kitchen cabinet! This baking pan belongs to my Wolf Countertop Oven HERE. I love this powerful oven and use it every single day. 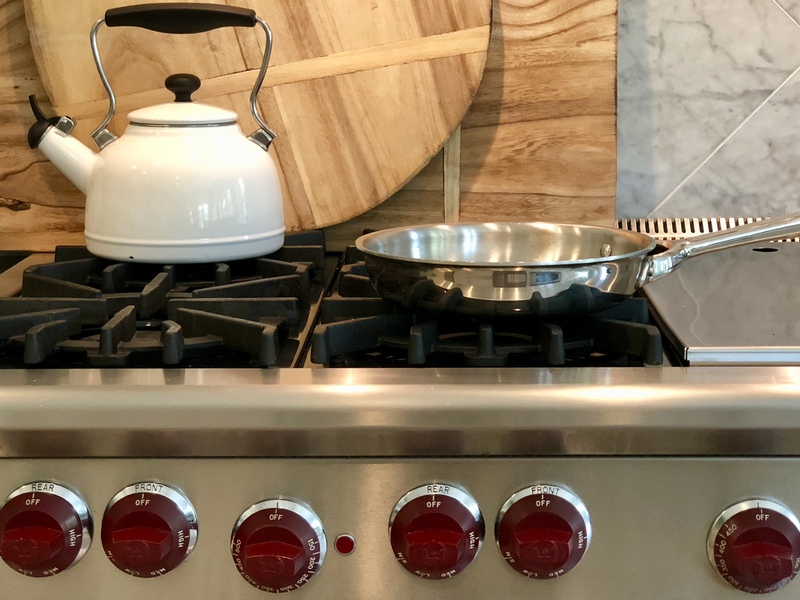 It’s the perfect size for cooking family meals, toasting sandwiches, heating up food, broiling, baking, and even cooking a full chicken and I love the convection feature when I’m in a hurry. It’s also great to use as a third oven on days when I’m making a large meal and need an extra oven. So this pan gets daily use! I decided to test out a couple different methods to clean stubborn grease off stainless steel. The first method I tried is a popular non bleach cleaner I already own HERE and use to clean my ceramic farmhouse sink. Cleaning the left side of the pan with the non bleach cleaner, (using a fair amount of scrubbing), yielded these results. It removed most of the grease but not all the grease. Next method is a solution of half water and baking soda. I applied the mix and let it sit for 15 minutes. The baked on grease in the corners was tough to remove with the baking soda, and required more scrubbing than the cleaner. In the end, I went over the entire pan with the non bleach cleaner to get the pan sufficiently clean. The results were fairly similar for both tests but the cleaner worked more efficiently. I also like the texture of the non bleach cleaner, it adheres better to the surface making it easier to clean. Next, I tried the two methods on a stainless steel pan. We have a powerful WOLF range that uses high heat, so often my pans get stained with baked in grease. Using the cleanser on half the pan, and minimal scrubbing, removed most of the grease stains. You can see the top half is clean and the bottom half has not been cleaned yet. I applied the baking soda mix and waited 15 minutes. The baking soda mix didn’t work as well on the frying pan as it did on the baking pan. The non bleach cleaner was the clear winner on the frying pan. For me, the part I liked least was having to wait 15 minutes for the baking soda mix to break up the grease. I don’t have the patience or time to wait for a cleaner to work after each use. Yes, a box of baking soda is less expensive than a can of cleanser, but overall I felt the cleanser performed better and was more efficient with no wait time. Now I know and have the right cleanser at home, I will use Bar Keepers Friend each time to keep my pots and pans sparkling clean! I prefer the liquid version of Bar Keepers when I can find it. Agree, it’s a miracle worker! Hi Denise, yes I like the liquid version too! I use it on my sinks. Denise, do you have a miracle for Stainless appliances? I DETEST the upkeep with the stove being the worst. Lol, basically I’m just getting lazy. I like HOPE products, I blogged about using the glass cleaner for my crystal chandelier. They also have a stainless steel cleaner I recently started using that works well. Hope it works for you too, let me know! You are very welcome Lynn! Give it a try, it works great!